Darrell has lived in the parish for over 20 years, having relocated from Warrington as a Master Brewer working at the Berkshire Brewery (Courage’s) until its closure in 2010. In the latter years at the brewery, his areas of work encompassed environmental issues, health & safety, quality systems and capital projects. Now retired, he runs an international strategy games website as a hobby. 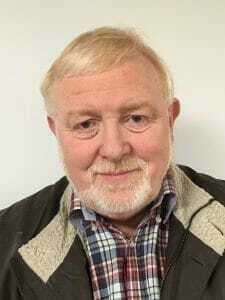 Over the years he has been on the Spencers Wood Hall Management Committee; a Parent Governor at Shinfield St. Mary’s Junior School; and on the PTA at the Willink School. His wife of 33 years teaches in Reading, and they have two daughters, 28 and 30, and two Labrador dogs. Having attended local planning, and developer, forums over the last few years; he finally decided that it was time to get involved in the parish activities, with all the changes that the area is undergoing. Joining the Parish Council was an obvious choice, and he was co-opted as a councillor for the Grazeley Ward.